[KPOP] Battle of the Idol Groups is on! Last year with the flood of new groups debuting, this year is the battle of the idol groups! And seeing as the cute concepts have dissapeared, they’re comming back with the matured image! In KBS 2TV’s “Sweet Night” which aired February 7th, SNSD had their Ideal World Cup. f(x) member Sulli did a special dance stage on SBS Inkigayo on February 7th. This was for her new position as MC for the show along with 2PM TaecYeon and WooYoung. It was said that Sulli was chosen for her bright and adorable personality. She incorporated Kpop hit dances such as ‘Oh!’ and ‘Genie’ by SNSD, ‘Sorry Sorry’ by Super Junior, ‘Ring Ding Dong’ by SHINee, ‘Abracadabra’ by the Brown Eyed Girls, ‘Bo Peep Bo Peep’ by T-ARA, ‘Mister’ by KARA, ‘Again and Again’ by 2PM, ‘Because of You’ by After School, etc. Along with her own groups songs ‘Chu’ and ‘La chA TA’. MC cuts are under the cut! [KPOP] Who is SHINee MinHo’s Favorite SNSD Member? On the recent episode of Star King aired on Febuary 6th, SHINee’s MinHo is forced to choose his favorite SNSD member. Choosing in a member vs. member style, the final two was SeoHyun vs. Yuri. In the end he chose SeoHyun. 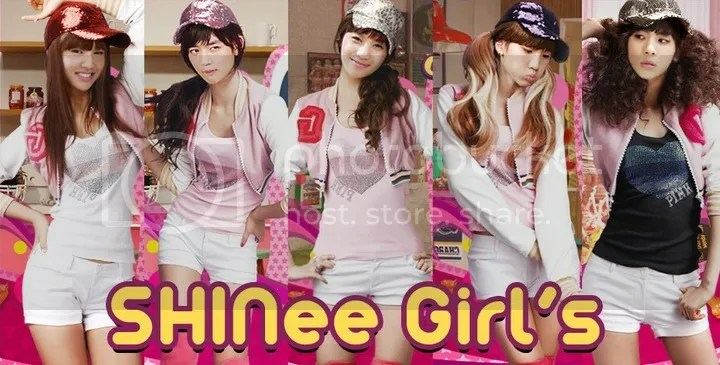 Recently a Netizen uploaded a photo of SHINee’s faces merged with SNSD. What kind of fighting am I talking about? Pillow Fights! On the Febuary 6th episode of Star King, SM Entertainment singers SNSD’s SooYoung and SeoHyun, SHINee’s Minho, and Super Junior’s LeeTeuk and EunHyuk fought against eachother in a pillow fight battle. Go under the cut for the other fights!